Some of the most challenging subjects for botanical artists are plants with white flowers. Traditional botanical art is presented on a white background, and painting white flowers that will stand out against that background is not easy. Even more challenging are the white night-bloomers whose luminance can’t really be conveyed on white paper. In both instances, one solution for artists is to use scratchboard, a non-traditional medium with a black background. Scratchboard, or scraperboard, was used in the 19th century as an economical alternative to the intaglio printing process. Instead of engraving on expensive metal plates such as copper, steel, or zinc, artists used a hardboard support covered with a layer of white clay or chalk and finished with a layer of black ink. Scraping off the black layer revealed the white below. This method, widely used in publishing until the 1950s, has become popular again with artists who now use the etched boards as the final piece of art and not as a printing plate. After the black ink is removed from a drawing, the artist has the option of adding colored ink or watercolor to the white areas. Because it is possible to produce extremely fine detail with a variety of sharp implements (X-acto or scalpel blades, needles, metal brushes), scratchboard has become very popular with wildlife artists for rendering fur and feathers. While it is less frequently used for botanical art, it can produce very detailed and intricate works. 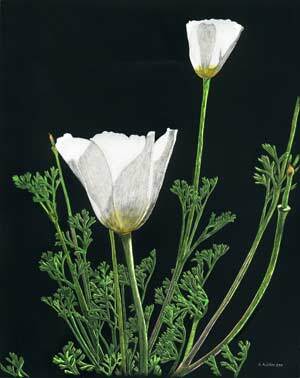 Susan Ashton’s “Mexican Gold Poppy (white variation)” is a perfect example of the usefulness of scratchboard in depicting white petals. The white variation of the poppy is unusual in itself, and placing the flower against the black background creates even more interest for the viewer. The artist has added watercolor to all parts of the plant except the white petals. In “Sphinx Moth and Datura wrightii”, Joyce Peters has used scratchboard to excellent effect to capture the magic of the moonlit night-bloomer and its pollinator. Both of these works were part of the Southwest Society of Botanical Artists’ exhibition, Portraits of Nature - Blending Science and Art, a juried exhibit of 57 works shown in 2013 at ASU’s Polytechnic Campus Library. 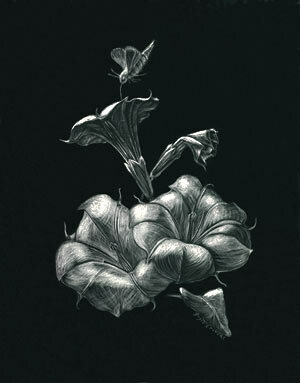 Additional works in scratchboard, including the night-blooming Periocerues greggii, can be seen on Susan Ashton’s website. Her “Ferruginous Pygmy Owl” shows how well-suited scratchboard is for portraying the fine detail of feathers. This appeared in the August 2014 issue of The Desert Breeze, the monthly newsletter of the Tucson Cactus and Succulent Society.